On Monday of last week, Gary Strydom peeled down for what was to become an eight-hour photo shoot at Gold&apos;s Gym, Venice with Irv Gelb. And peeled is certainly the correct term. Just ask the impressed folks at Gold&apos;s that day, which included, Gary says, Charles Glass, Bob Cicherillo, Tom Prince and even Strydom&apos;s longtime adversary during the early days, Mike Christian. 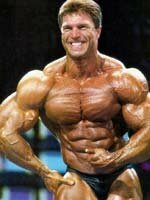 At 47 years old, Strydom looks as good, if not better, than the era when he was one of the IFBB&apos;s top stars. For those of us who&apos;ve been around long enough to remember, the South African native copped the NPC Nationals in 1986, and won in his pro debut at the Night of Champions the following year. South African Native, Gary Strydom. In 1988, a 230-pound Strydom finished fifth in his initial-and only-crack at the Mr. Olympia crown. In 1990 wrestling mogul Vince McMahon started the World Bodybuilding Federation; Strydom took the money (no official numbers have ever been given on his contract, but I&apos;m sure it was quite lucrative) and ran. All the way to the bank, as Gary breezed to back-to-back wins in the WBF&apos;s short-lived, two-year adventure. WBF BodyStars was a weekly television program that aired in 1992 on USA Network. It was co-hosted by Vince McMahon, Cameo Kneuer, and Lex Luger. The show followed the training lifestyles of the bodybuilders, featured a variety of skits and humorous quips, and offered general bodybuilding and health-related advice. The program changed its title to BodyStars in late 1992 after the WBF had disbanded, and having lost half its appeal, was soon taken off the air. But, even McMahon won&apos;t put up with heavy losses for too long (despite creating both a television show and a magazine devoted strictly to the WBF), and in 1992 that game was over. Strydom, owner of the popular clothing line Crazee Wear, bought a condo near in the beach in Venice and just enjoyed life until he decided to get back on stage. That stage was the Beacon Theater, at the NOC, in 1996; that was the last time his fans got to see him compete. Fast-forward a decade. I see Gary sitting in the seats at the Iron Man Pro in February; we chatted for a long time after the contest and Strydom indicates he wished he would have been in the line-up. Says he&apos;s in great condition, at over 290 pounds. I could see the look in his eye - he was more than anxious to prove he could tangle with the younger dudes. No Masters competitions for this guy. "Those shows are for the people who can&apos;t compete on a high level," he would always stress. I knew it wouldn&apos;t be long for the announcement to come - yes, Gary Strydom was coming back once more. About a month later Gary calls, and says he&apos;s going to compete at the Colorado Pro on May 13 and the New York Pro a week later. But why, after all these years, does Strydom find a need to put on the posing trunks again? For several reasons. First of all, Strydom watched closely when the Ben Weider mandate was released last year, citing that bloated belly&apos;s would no longer be tolerated, that the small waist, flat tummy and overall aesthetic look would be rewarded. Which, of course, the 6&apos; 1 1/2" Strydom possesses. "Bodybuilding has turned into mass building," says Strydom, "and it&apos;s not something most people, including me, would want to look like. These distended stomachs are ridiculous. Bodybuilding should be about balance; if one bodypart stands out over the rest of the physique, that person should not be rewarded with wins, or high placings. "I wanted to prove that a big man could still have a small waist, a balanced, aesthetic physique. I weighed 278 pounds today (Friday, April 21) and am tight and grainy with a good, overall flow. I think I look better now than when I won the WBF titles; I weighed 258 then, but wasn&apos;t nearly as hard as I am today." He is admittedly concerned that the credo might not be followed, however. "They didn&apos;t use that as a guideline at last year&apos;s Mr. Olympia," Strydom says. "But, after watching the Iron Man, and seeing Dexter Jackson win the Arnold again, I feel better about the direction the sport could be going. I&apos;m a big fan of Dexter&apos;s physique, and feel I&apos;m a larger version of Jackson." Is The New Mandate Against Bloated Bellys Being Properly Enforced? Gary, who normally trains at Gold&apos;s from 9 pm to midnight, perused the Colorado and New York line-ups and says he feels confident "I won&apos;t embarrass myself." "I will probably be around 270 on stage; I really don&apos;t have any weight to lose," he said. "I was ready to go 10 weeks ago - I was really tempted to enter the Iron Man." I also got Strydom to admit what I&apos;ve known for sometime now. He&apos;s bored. "Yes, I miss the excitement of competing, of traveling around the world and meeting all the fans," Gary says. "That was the thing I&apos;ve missed the most over the years." And, he still has that droll sense of humor. "Somebody asked me when I was doing the photo shoot if I was thinking about competing again - I said yes, that I was getting ready for the Muscle Beach contest," Strydom quipped. So, what&apos;s the secret to your fountain of youth, big guy? "I guess it&apos;s a combination of things," he says. "Genetics, of course, and years of steady training, knowing what type of training works for your body, becoming precise about nutrition, how much cardio is necessary to be your best and son on. "I&apos;m really confident right now, and feel I&apos;m going to do well in these contests. 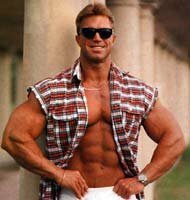 I want to show the bodybuilding world what the new, classic version of Gary Strydom looks like. The New, Classic Version Of Gary Strydom. 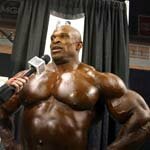 "My goal is to get back on the Mr. Olympia stage. I want to be in the line-up in Las Vegas, and think I would have a good shot at knocking off some of the people who have placed pretty high in that show." Welcome back, Gary. And, this time, don&apos;t stay away so long. In his next column, Lonnie "The Swami" Teper gives us an inside look at the Colorado and New York pro shows.